This quote speaks it all for itself. Love conquers all things. Without love where would we be? It is often easy to share love with friends, family, and even strangers but how often do we truly give love to ourselves? This is the half way point of the challenge and we invite you to give some big love to yourself!!!! Thank yourself and this incredible body for the accomplishments you have incurred over the past couple of weeks. Love yourself for being open to a new experience and starting the year with movement, peace, gratitude, kindness, community, and well being. For your hard work maybe treat yourself to a massage, a special hike, a love filled meditation, a film, a coffee/tea date with your favorite book, a dinner out with friends. Or have someone around you share some love and take care of you! I find my calendar fills up quickly so scheduling in time for my own yoga practice, scheduling one indulgent activity a week, and one date night with my special someone helps keep the feeling of love, both giving and receiving, abundant. I have also learned to put my work down and snuggle a dog, listen to the imagination of a child, get my feet or hands in the dirt, and take a deep breath to truly enjoy and love these mini miracles of life all around us. With our hearts lifted and full we can celebrate this in our peaceful warrior pose! First begin in warrior 2. Keeping your feet grounded, and your legs strong as they are. Turn your front palm up and gather all that space as you reach up and back, allowing your back hand to glide down your back leg but using your strong core for support. Be careful not to put weight into your knee with your back hand. Reach strong through the finger tips and take your gaze up or down to the back foot. Keep the belly hugging to the spine and lengthen through your side body. Breathe into your ribs and create length from the toes to the fingertips. Variations are wonderful in this pose as you decide how far you go. There is an option to bind your back hand into your opposite hip pocket for more shoulder opening, and a revolved variation by rotating and lifting your heart to the sky. This pose can also be done with the back knee on the ground for more support. Enjoy and share your Big Love! Yoga is the perfect exploration of the human body and movement as well as our depths, our souls. We do this by tuning into what we feel and what we are experiencing through each moment. Binding our breath with our movement, we create a dance, a dance that is life. We can step further into ourselves, deeper into what lies beneath, our values, calling, needs, desires and so much more. Take the time to explore what it is that causes your soul to dance inside your body. Dancing is my favorite form of creative expression and art. When I can’t find the words to express what I’m feeling I turn to movement. Whether happy, sad, mad, confused…you name it. Dance is my catharsis, especially freestyle dance. I just put on a song that I’m feeling at the moment, turn it up and MOVE! Without any self-judgment or fear, I move freely. It’s invigorating and healing! When we step onto the mat, we begin to open the gateway to making truly profound discoveries about ourselves, and releasing patterns and behaviors that keep us from living up to our fullest potential. 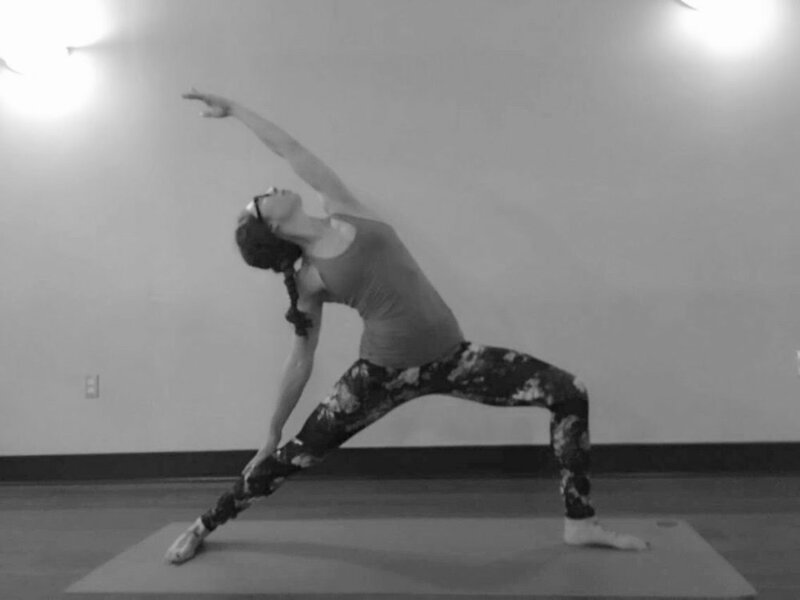 Dancer pose stimulates your sacral, solar plexus and heart chakras. Open up in this powerful posture, by finding balance in the realm of sensuality, creativity, personal power, and love and compassion. Today I invite you to dig into your own form of creative expression. Sing out loud, write a poem, dance, paint, draw, flow, free yourself!! Stepping into dancer pose. We first begin in a balance, taking our weight into one leg and spreading your foot wide. Find your drishti, your focal point, to gaze into. Engage your abdominals, and start in a stretch with your heel to your seat, opening up the front of your thigh (quadriceps). Taking your grip onto the inside of your foot, lengthen up through your spine as tall as you can reaching your opposite hand high. Equally press your foot and hand together, extending the hips forward and taking your back leg further into your hand. Continue to engage the belly and shine your heart forward and up. Use your other hand to reach out in opposition, perhaps taking gyan mudra. Shine your gaze and heart up and out. Be cautious of your lower back, try not to over sway through your back. Instead, engage your abdominals and lengthen your spine. 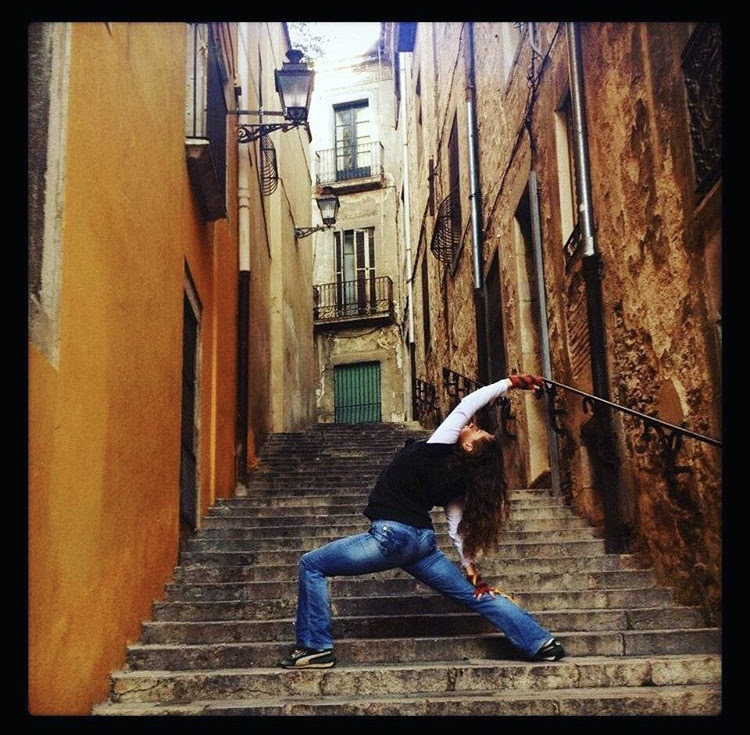 Variations include using a strap to clasp your ankle instead of hand to foot/ankle, touching a wall with your front hand for balance, keeping your leg low, or for an added challenge hold your back leg with both hands or move into King Dancer. Dancer, "Natarajasana" With a Partner! Trees are the source of our very breath and in sharing these beautiful qualities with the trees we can find we all breathe easier. A bounty of wisdom is offered through the trees and their reminder to take a deep breath, look up, be green, and most of all be present. I personally feel at home among the trees. They provide shade from the sun, an umbrella from the rain, they remind me to look up from my phone and take a deep breath, to ground and stand tall, and to be firm but flexible when the wind blows. I find whenever and wherever I travel, the trees call to me, they invite me to come join in their beauty, bask in their wisdom, release and let go, and feel at home and safe wherever I am. At my first yoga training in Costa Rica a very special teacher shared with me one special gift that the trees offer up: this teacher told me if there is ever anything too heavy or too big of a burden to carry that I can breathe it out and give it to the trees. They are there to listen and can help carry the load if we trust them. I once shared this message about trees on a first date….and come to find out this is the moment my husband knew he was going to marry me. Tree pose is another one of our amazing standing balances. Starting in Tadasana, mountain pose, notice what happens as you begin to shift your weight to one side. Gently left one leg and externally rotate from your hip to allow the arch of your foot to connect with your opposite ankle, calf, or thigh (be sure to avoid the knee). Root your foot down but grow tall from the belly and crown of your head. Allow for all of the variations of tree pose. Feel free to use the support of a tree, a wall or a partner when practicing balance poses. Play with your arms at your heart, lift to the trees, interlaced behind you, or maybe even close your eyes and turn in. If you fall out remember it’s okay, smile and come back. Tree Pose, with a partner! “We have never stayed home long enough to experience the truth about ourselves." Through yoga we move toward stillness. Because it is an internal practice, a chance to feel embodied and connect to ourselves in a relaxed and focused way, it becomes a time for self-study and to catch glimpses of the clarity we all seek. The yoga sutras tell us there are just two types of actions: those that increase avidya (incorrect comprehension) and those that reduce it, and bring true understanding. Malasana can bring us home, deep into ourselves, allowing us to dwell within. Squatting, a simplified version of malasana, by its very nature has a grounding quality—a downward-flowing energy that can help bring on calm. In the non-Western world one sees people crouched in a squat to cook, wait in line, garden, read, etc. This tradition has many benefits and is effective in toning the entire lower body. It works the quadriceps, hamstrings, gluteal and calf muscles, plus it strengthens the lower back and core. This less intense variation of malasana is with the feet hips’ distance apart and the spine straight up. Separate your thighs slightly wider than your torso. Exhaling, lean your torso forward and fit it snugly between your thighs. Press your elbows against your inner knees, bringing your palms together in anjali mudra, and resist the knees into the elbows. This will help lengthen your front torso. In the final pose, you are in a squat, feet together and knees apart, with the arms wrapped around the shins and the head lowered toward the floor. In malasana, the arms are the garland, your head bows forward and the attention is drawn inward so the effect on the body and mind is both grounding and quieting. Hold the position for 30 seconds to one minute, then inhale, straighten the knees, and fold forward. Bound Angle Pose, "Baddha Konasana"
This goal of yoga is so simple yet can be elusive. Nonetheless, the student of yoga, with practice and persistence, can slowly recognize patterns, shift attitudes, alter behaviors and notice that one’s understanding of reality changes. Things become clearer and one can see what was previously hidden. The yoga sutras suggest that through asana (poses) and pranayama (conscious breathing), we are preparing for dharana: holding the concentration or focus of attention in one direction. It’s this focusing of the mind that allows us to see reality as it truly is, and not clouded with resentments, fears, and insecurities. Baddha konasana is another grounding pose that allows for stillness and introspection—two essential ingredients for clarity. We invite you to practice this pose today and bring extra attention to slowing down, observing, taking a deep breath, and then following with action. Come to sit with your legs in front of you. Bring the soles of your feet together, and bring your heels toward your pubis as far as comfortable. If your knees are higher than your hip bones, and/or your sacrum tilts backward when upright, use a lift (blanket, block), and/or take your feet farther away from your pelvis as needed. Take hold of your feet with your hands. Root strongly through the hips and extend up through the chest and spine. Let your chin come down toward the top of your sternum. Fold forward by tilting your pelvis. Use your thumbs to open the soles of your feet like a book. Do not overly flex your back to come down; people who can safely go deeply into forward folds can do so because they have good range of motion in the hip joint. Have a wonderful day of observing! Reclined Butterfly, "Supta Baddha Konasana"
I love utkatasana because it helps us practice sitting with a comfortable level of discomfort. As a result of practicing this pose, which demands strength in the quadriceps and core, steadiness in the legs, and openness in the shoulders and the hips, our threshold for discomfort increases. As you practice chair pose today, notice your thoughts, especially those telling you to come out of the pose to avoid the intense sensation in your legs or arms. See if you can hold the pose with more ease, less resistance, just knowing that it too is temporary. Take a moment to also notice uncomfortable situations and your reactions/tendencies off the mat. Our yoga is always letting us practice how we react to the uncomfortable so we have the tools to face these situations in our everyday moments. Stand in tadasana. Inhale and raise your arms perpendicular to the floor. Either keep the arms parallel, palms facing inward, or join the palms at the heart center. Firm your shoulder blades against the back. Take your tailbone down toward the floor and in toward your pubis to keep the lower back long. As you sit back into the hips, scoop your belly in and continue sending your tailbone down. Lift your arms alongside the ears and take your gaze up without compressing cervical spine. For a gentle variation, don't sit so low in the hips and keep the hands at prayer at the heart. Stay for 30 seconds to a minute. To come out of the pose, straighten the knees with an inhalation, lifting strongly through the arms. Exhale and release your arms to your sides in tadasana.